I love using readers theatre scripts to introduce key concepts. 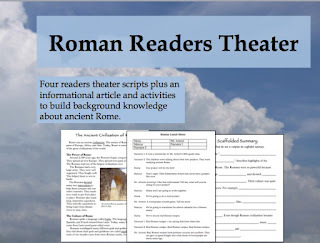 Kids find scripts engaging and interesting; the script format leads to high engagement; and kids have a real reason to pronounce and use key vocabulary. Writing these scripts makes me feel like I'm a writer on a 50s-era variety show. What madcap situation should I use? How can I put characters in an interesting situation? I work under some serious constraints, too. I have to make sure that the roles are fairly even, or squabbling will ensue. I have to make sure that key vocabulary is repeated by more than one character. And whatever situation I develop must come to a conclusion in two or possibly three pages. 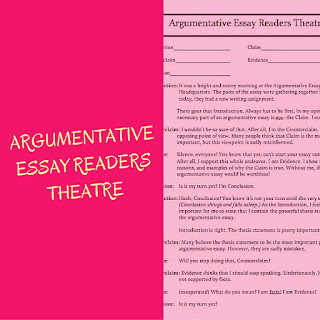 This week I wrote a new script about argumentative essays. Like most of the scripts that I write, this one was born from necessity--I wanted an engaging way to introduce the parts of an essay. My goal was for students to be able to annotate an argumentative essay and mark the parts. This got me thinking about what the parts of an essay would be like, personality-wise, which led to the script. Bringing the parts of an essay to life can be fun. Try it out! The script is free and can be downloaded here. For many students, summarizing a narrative is far easier than summarizing nonfiction. Narratives are organized in time order, the way that we experience life. The underlying structure of the narrative summary is already built in to our daily experiences. But this doesn't mean that summarizing narratives is easy. Easier, yes, but not at all easy. 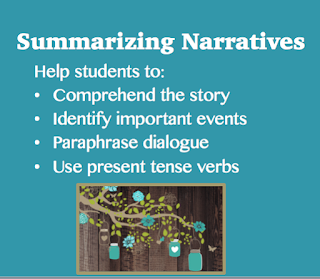 In fact, students often struggle with many parts of summarizing a narrative. Here is what I look at when I assess student summaries. These are arranged in priority order--to me, it's important to work on comprehension before dealing with writing a summary in present tense. Comprehension: Did students understand the story? It seems obvious, but many teachers miss the fact that a failure to summarize is based in a failure to comprehend. A great way to explore this with your class is to have them summarize an easy story. With the comprehension weight lifted from their shoulders, students can focus more on the process of summarizing. If you listen to students as they collaborate, you may hear some great metacognitive statements. Important events: Very capable students often write the longest summaries. "But everything is important!" a student argued. And she's not wrong. When students can really comprehend how all of the events in a story fit together, they want to include all of those fascinating events. Of course, a summary needs to be shorter than the original text! I use the question "Which event does not contribute to the outcome of the story?" to help students choose which events to leave out. For example, as my students were reading the drama "Perfectly Happy", (available here) many wanted to include all of the trades that the main character made. Looking at examples of how different students left out events or collapsed the list of events helped students to figure out what needs to be included in the summary. 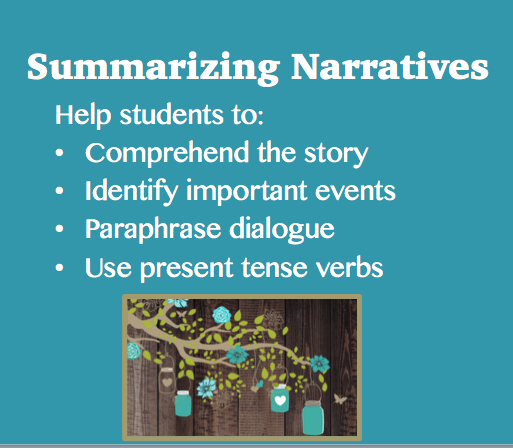 When I realized that students were having trouble with choosing important events to include in their summaries, I taught a series of lessons about how to plan the narrative summary. Students used sketchnoting to take notes--and went back to their notes for the next assignment! 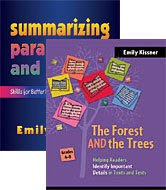 In my Summarizing Stories bundle, I have some activities that focus on helping students to paraphrase dialogue. You can also show some dialogue from the story, or, to make it even more engaging, from a video. How can students paraphrase this dialogue? Using present tense: Many of my students are now working on this aspect of summarizing. After four weeks of summarizing narratives, they have a good handle on the basics and are working on the finer points. Encouraging students to use present tense in their summaries will lead them to more success in high school--and helps them to consider the role of verb tense in their writing. It's a great example of how writing and grammar work together. 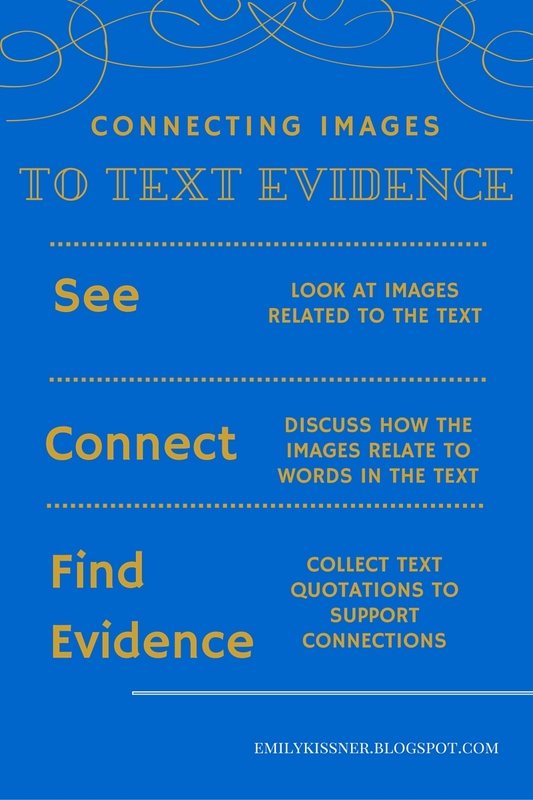 I just love this quick routine for building student skill with finding text evidence. Yesterday, as we were reading the classic "The Land of Counterpane" by Robert Louis Stevenson, I showed students classic illustrations of the poem. Here is one of my favorites, a 1907 illustration by Jessie Wilcox Smith. Not only does the illustration help to give students crucial context for the poem, but it gives us a quick, engaging task for finding text evidence. "Can anyone find a line in the poem that connects to this image?" Suddenly students had a real reason to go back into the text, and they loved scanning the illustration for tiny details. They eagerly plunged back into the text to find the lines that connect directly to the image. A quick image search yielded other illustrations, as this poem has been heavily anthologized. We looked at the similarities and differences, always going back to the text--how does this connect to specific lines in the poem? Because we were also working with a companion expository text (found in my Comparing Texts 2 bundle), our next step was to broaden our comparison to see if sentences from the expository text could be connected to the poem. And they could! Matching images to texts is highly motivating for readers, and it's fun to do. 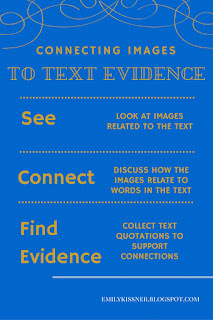 Even better, though, it builds connections for learners. What are your favorites for this kind of activity? Stuffed toys are easy to acquire, and lend themselves to many uses. At the bare minimum, stuffed toys are great to have for students to access freely through the day. Even in sixth grade I have some kids who deal with Monday by getting a favorite stuffed animal to sit with them during class. How awesome is that? But stuffed animals have other uses, too. When modeling a literature circle or a classroom routine, stuffed animals are great for playing the negative roles. I never have students play these parts, as I don't want to encourage the negative behavior. But stuffed animals are great for this because they grab student attention and are so cute. Stuffed animals are also helpful for retelling. They don't mind being tasked with multiple roles, and using a stuffed animal can help a student work out "who did what to whom". I first started buying K'Nex for my own two boys. They offer an interesting building system that provides different affordances than Lego. They are also (fairly) inexpensive to purchase with the 40% off any item coupons that Michaels and A.C. Moore occasionally offer. After I saw how much my own kids like K'Nex, I found the education sets that K'Nex offers. They are great! Topics like Bridges, Force and Motion, and Simple Machines are fun to teach with the K'Nex sets. Kids like having the chance to follow the directions or create their own items. For our current Force and Motion unit, kids are using both the stuffed animals and K'Nex vehicles to investigate the importance of seatbelts. I first brought Marbleworks into the classroom to be something to occupy my oldest son before and after school. Back when I first started teaching in elementary school, my oldest son was a kindergartener, and keeping him entertained in the hour I spent working before and after school was an important consideration! Slowly Marbleworks became an indoor recess toy, and then I saw its value for learning activities. Marbleworks is great for introducing inquiry and testable questions--just give kids a timer and say, "What could you do with this?" 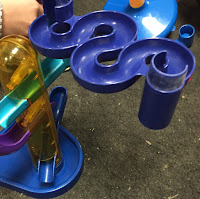 Right now, Marbleworks is a toy that kids can use in science as we work on forces and motion. Where does the marble have the most potential energy? What could we do to increase the amount of time it takes the marble to get to the bottom? I also like to use Marbleworks to bring out cooperation and teamwork in kids. This is such an engaging toy that kids can usually work together well to put together a great set. Sometimes, when groups of friends aren't getting along, I'll actually assign them to play Marbleworks, on the condition that they cooperate. Then we can talk about their experiences: "What worked well? What can you use in other situations?" 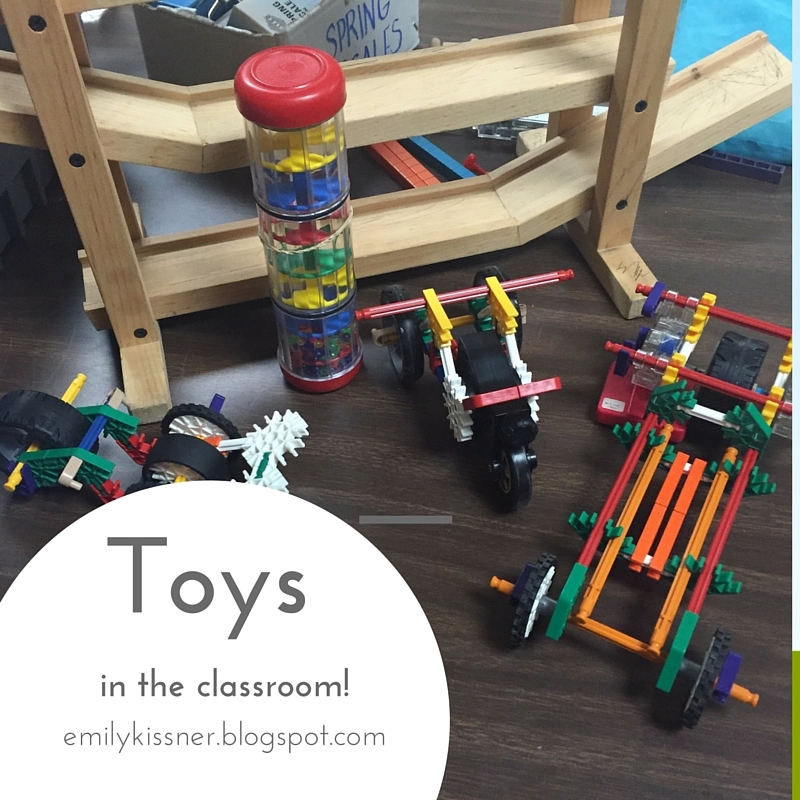 These are just a few of the toys that I have in my classroom. No matter what I bring in, I seem to be able to find a relevant use for it! My classroom certainly is neat and clutter-free, but kids do find it engaging. What toys are your favorites for the classroom?